Kara's Getaways and Much Much More ~~~~ Where to Go What to Do: Birthday Fairy Strikes Again ~ LED Balloon Surprise! Birthday Fairy Strikes Again ~ LED Balloon Surprise! On the eve of our children's birthdays we place something all over the floor of their rooms. So, when they arise a WHOLE year older on the morning of their birthday their is a surprise to get their day started off a little extra special! I know CRAY - CRAy of me to add just one more thing to the already list of crazy things parents do for their kids (ie. the stupid elves that trash our homes, luny leprechauns that pee in your potties, etc). But the birthday fairy is a little bit different. It doesn't have to be B-I-G... It is just a fun addition to their special day. All our kids know that the birthday fairy is us! Which is neato cause they actually thank US (not some fantasy) for our thoughtfulness and generosity. As an added bonus often the other kids get in on the plan. On more than one occasion - I have had another kid approach me and say, "mom, what are you doing for so and so's bday? Because I have an idea!". Some of the best birthday morning surprises have come from their sibling's minds - for example one year my second daughter suggested journals and notebooks for her big sister who is SUPER passionate about writing. BEST idea ever! This year we did one of MY FAVES! -- It looked so incredibly cool. LED Balloons (that flashed!). 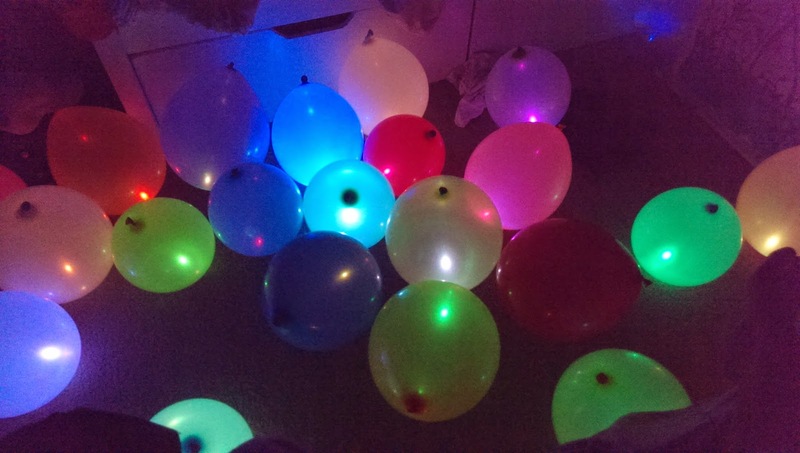 My second child turned 13 on Sunday and her room looked like a disco the night before. What a way to usher in the TEEN years! Here is the link to Amazon where I got my TOTALLY AWESOME - blinking balls of birthday fun! Keep in mind that this was done creatively not necessarily costing a ton of $. Barbies were always sale ones, lots of barbie clothes because those are reasonably priced and I even included just printed pics of the glamorous girl. Makeup was always buy one get one and included a bunch of Dollar store stuff (thank God she didn't get an eye infection). Bras were from Ross and TJ Maxx (great prices on undergarments)!